Venus has been putting on a great show, in the glow of the setting Sun, for a month or so now and it will continue to do so throughout July and August. Yes, I know it’s very low but it is worth making the effort to spot it if you can. For me, it is visible between the trees just past Charlie’s house as soon as the sky darkens. Unfortunately, I have to lean out of an upstairs window to find it, so if you see an elderly gentleman hanging out of a bedroom window with a pair of binoculars, don’t worry – it is probably me looking for planets! As sunset gets earlier over the next two months (notice I didn’t say “as the nights draw in”! ), Venus will appear to remain at the same height but just drifting towards the west. Saturn is still with us too, due south as it gets dark but moving towards the southwest as the summer drifts by. It remains in a right-angled triangle formation with the stars Spica and Arcturus, though. If you don’t mind an early start, there are planets visible in the early morning. I’m often out of bed before sunrise, sometimes several times in a night, just to keep an eye on the north-western sky. July 22 will be well worth the effort as Mars and Jupiter will be very close together, in the glow from the rising Sun, visible from a little before four in the morning until the sky gets too light. Be very careful though, if you are using binoculars, to put them away well before the Sun appears! Jupiter also stays with us for the next few months, moving away from the Sun as the days go by. 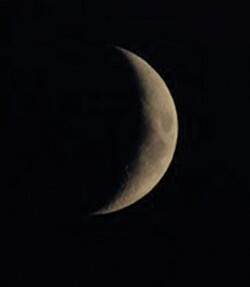 Look out for it on August 4 when it forms a triangle with a crescent Moon and Mars. Mercury will be below them but probably lost in the murk. If you are more of an evening person, late July through to mid-August is probably the best time of the year for spotting meteors. Firstly, the Delta Aquarids meteor shower peaks at the end of July and then the Perseids shower peaks on August 12. The odd names they have are due to the apparent origin of the meteors they produce. So, if you see a meteor on July 30 and trace its path back, it may well seem to have come from the direction of Aquarius. Similarly, one in mid-August may seem to have come from Perseus but please note, this does not mean you should be looking in the direction of the Aquarius or Perseus for the best view. These apparent origins, or Radiants to give them their correct name, are just worked out by astronomers to give them something to do when it’s cloudy – oh, and to identify the individual showers. No, the best place to look is wherever you can sit comfortably and stare at the largest bit of dark sky available. I find that this is best done in the company of others and preferably with a warming drink at hand. Speaking of which, I must nip out now and have a bit of a look at the evening sky. Cheers!